I chatted with him just the other day. He was whining about early briefings and weather cancellations but he knew he still had the best job ever. Lex is gone. His wit, wisdom, and humanity. The blog is silent. His books, for there would have been many, unwritten. He truly had a gift that he shared freely even when he didn’t really have the time. His posts drove the rest of us struggling hacks to push that much harder. The way he would transport you into the cockpit was unlike any talent I’ve ever read including a long list of best-selling authors. Lex had them beat but you’d never get him to admit to it. Over the years we’ve watched his kids grow up and head off to school, we witnessed the pride in the old fighter pilot when his son earned his own wings of gold, we shared, we understood, at times we even helped. Most of us never met the man whose company we enjoyed so much. Such detached closeness is a strange phenomenon of blogging that Lex wrote about often, the compassion of people that were friends yet perfect strangers. I didn’t know Lex but I knew the man and his tragic loss is every bit as painful as the others on my growing list. Flying is a calculated risk, flying grey jets in harm’s way even more so. Lex lost his share of wingmen along the journey and as he said on several occasions, sometimes bad things happen. Training minimizes the risks but no amount can completely mitigate them. He understood and accepted the danger. 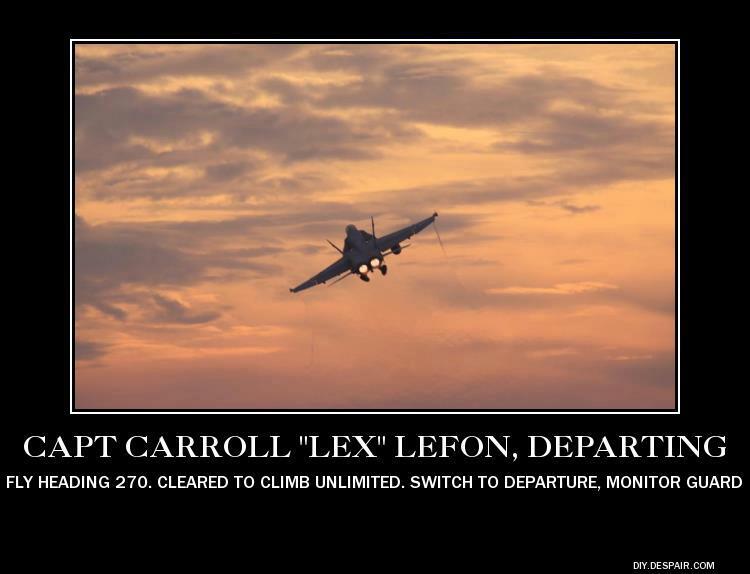 I’ve linked to his material often over the years but for those of you who didn’t have the pleasure of knowing him, Lex served a full Navy career retiring as a Captain. He couldn’t stand being grounded so he wrangled a weekend gig dogfighting little Vargas with an air combat outfit. It was good (any paid flying is better than none) but it wasn’t his old mistress the Hornet. Then along came an opportunity to fly the F-21 Kfir with a civilian contractor as an aggressor pilot. He was thrilled as was his entire extended internet family. The stories were fresh, you could feel the adrenaline in his writing. Lex was back where he belonged. Shockingly the ride ended far too soon. 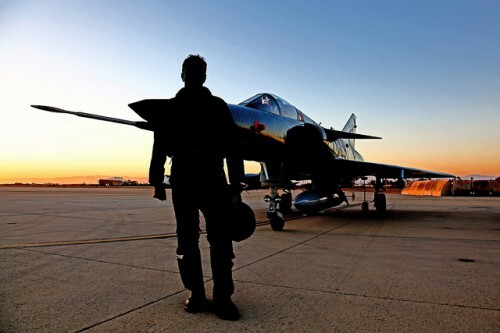 The fighter pilot fraternity is statistically small to begin with, carve it down to civilian contractors flying aging Israeli Kfirs out of NAS Fallon this week and the alarming news of a fatal crash narrowed down to our man at warp speed. We gathered online hoping beyond hope that it wasn’t him but when one dreadful day dragged into the next without so much as a peep on his prolific blog it became painfully obvious. If we had all been in one room the bar would have stayed open long into the wee hours as we toasted our friend. Lex of all people would have appreciated the gesture. It’s a small comfort that he died doing what he loved. My thoughts and prayers are with his wife and kids who, although I’ve never met, I know them as my own. I’ll add more tributes as they come up. The list will be long. Well written, Steve. You also have a way with words. There will be time for stories later, but for right now, one of my favorites was when he wrote about how he got the nickname “Lex”. I’m going to miss him, and the cluster of regulars on his blog. Well done, Steve. Captured him perfectly. I did have the fortune to meet him once, and in real life he was just like he was in digital. He will be missed. Steve – longtime reader of Lex here; probably started reading him less than 6 months after he got the blog started. I am heartbroken as is everyone else. So shocking, so impossible to take it in. It has been suggested that the readers of Lex take up a community collection to send to his family and it was also suggested by a reader that you may be the best person to advise whether that would be appropriate. I have his home address from a favor he did for me several years ago and would be happy to coordinate collections and send something out. Can you please email me at kpayant at travelers dot com and let me know your thoughts? I am sorry to ask this in the midst of your own grief. Well said Steve. Godspeed Lex. Steve, I was sure I’d commented on this, but I wasn’t too coherent that day. Anyway, I thought this was outstanding. Thank you. I too noticed the energy, the quickened pace, the newnwess inhis writing, when he took the Kfir on. I smile, after frowning at first, when I think of the tragedy because I too realized he was doing what he loved. He lived an exceptional life.